After working at the Tempe clinic on Sunday, Suzie and I met Jan Wilson at my house about 5:00 PM to load up 79 traps into three vehicles. Thank you Bill for washing all the traps from last week! We were headed for Queen Creek to trap 70 cats. The Healing Heart's mobile was to be at a caregiver's property Monday morning to fix them. We caravaned down to what seemed like the back of beyond. When I travel for TNR I usually go to points North and West like Aguila, Prescott Valley or Gila Bend . This was new territory for all of us. Healing Hearts recently purchased a mobile to help spay and neuter for rescue groups. It had been a mobile clinic but they refurbished it and it is now first class. Dr. Slocum is the veterinarian and we all know and love her from the AZ Animal Welfare League. To find out more about Healing Hearts visit their website. The property we trapped at was sort of a sanctuary for exotic sheep, deer, birds, dogs and of course, feral cats. Yes, 60-70 cats roamed this six acre property. I felt like "a kid in a candy store" and felt this would surely be like "shooting fish in a barrel"! Oh those sayings from my Mom come in handy...I can never remember if it was Shakespeare or Ben Franklin who said them. I just hoped we'd get them ALL in "one fell swoop".! We trapped until late in the evening and captured about 40 cats. Jan brought plenty of diet Coke and snacks to keep us awake and going through the evening. The cats were stored in the caregiver's garage overnight. We had at least 20 traps out overnight. The drive back on the 202 was scary and at times it felt like driving into the abyss. But we caught lots of cats. One always fears that one's efforts will turn to naught. In fact 40 cats was not 70! The mobile fixed 58 cats on Monday having caught 18 more cats overnight. Suzie went back the next night to help with aftercare in the garage and to set more traps. She can give you a rundown on that experience - just ask her next time you see her. I was on to my next trapping job that night. After this, trapping jobs this week seemed pretty tame. That night I had mall job for four cats that ended up being five cats after two nights of trapping. The caregiver had a "bad back". Seems like everyone does these days...must be contagious! Took cats to the vet in the early AM. Two more cats were trapped overnight in Queen Creek and were fixed the next day for a total of 60 cats TNR'd. Four kittens were rescued and went to Healing Hearts for foster and adoption. There are 3-4 cats left there to fix and hopefully the caregiver will follow through. Suzie and I headed to Queen Creek late morning to release the cats and pick up our traps as we needed them. The caregiver was not much help which is the case in many situations. Often the feeders offer to help but it is easier to do the job yourself. We loaded up all but 9 traps in our vehicles after the release and headed back to town. It was very hot! Now we had LOTs of traps and covers to wash. Jan brought the remainder of the traps back later in the week. Picked up cats at the vet for aftercare and set off for the next trapping in Sunnyslope for eight cats. I only caught six , one with the drop-trap. This was a difficult situation. 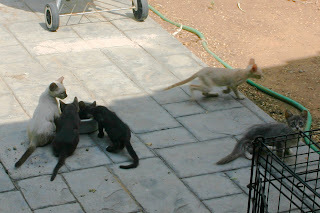 It is a non-profit organization and the feeder was not supposed to feed the cats on the property. Fortunately, one of the volunteers at this non-profit convinced them to let us trap there and she helped me. She had used the Spay Neuter Hotline previously for cats at her home. The second night's trapping was a bust as the feeder put food out as they often do. In between I transported and after-cared 5 cats for another caregiver who lived in a small apartment. Took cats to and from the vet again - total of seven; six from the business in Sunnyslope and one from the "bad back" lady. Picked them up for aftercare and set off for a drop-trap job. A note on Sunnyslope...I've been trapping there for years and based on my experience I truly believe there has to be more than 350,000 feral cats in Maricopa County if one looks at number of ferals per square mile. Sunnyslope is an area in North Phoenix originally "colonized" by those with Tuberculosis looking for a cure. 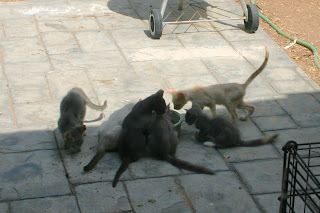 The cats were being fed behind an historic house built in the 1920's. Before then patients lived in tents. Makes one thankful for AC! Released cats in the AM. Tonight's trapping was interesting. It was at a hospital in central Phoenix. ALL the cats there but two had been trapped by a caring doctor who took on this project, which was an amazing accomplishment. I was helping her catch the last two cats. It was a cool evening and I sat for several hours waiting and waiting for those two cats to go under the dropper. Watching cats can be interesting. Probably not as neat as cable TV but still neat. I caught one right away but the other was a stinker! I'll be back there next Thursday night to try again. I'll update you on my success. I love challenges like this! Took the one cat from the hospital plus six cats Roni had trapped to the vet in the AM and picked them up for aftercare in the afternoon. The caregiver picked up the hospital cat. 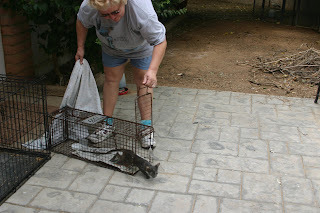 I released the six cats Roni had trapped on Saturday. She caught them all as she usually does. Go Roni! Having a portable drop-trap makes for great trapping when one has a small car. Trapping can be challenging and exciting. Please consider helping with trapping and transport. We especially need volunteers to help during the week. 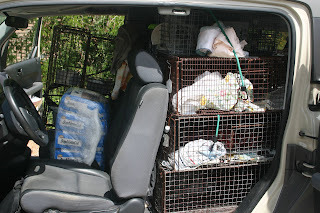 The mobile fixed 58 cats feral cats there the first day and two more the second day for a total of 60 cats TNR'd. Four small kittens were taken in for adoption by Healing Hearts. There 3-4 more to fix and we plan to work with the caregiver to get them fixed. It is often difficult to finish jobs like this. Although we try, the caregivers often are do not cooperate. We encourage people to fix ALL the cats and to watch for additional cats that are not eartipped. Next week - Two big weekend clinics and more BIG trapping extravaganzas!